As their name would suggest, peppers like it hot! While not the hardest vegetable to grow, they do not like cold temperatures, similar to eggplants. Here are some quick tips for growing peppers. 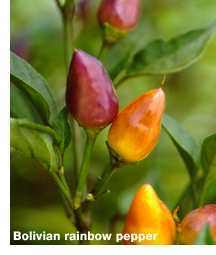 Peppers are very tender plants, like eggplants, and are very susceptible to cold temperatures. Transplant pepper seedlings after the soil has warmed and the danger of frost is passed—in fact, too cool soil may inhibit pepper seedling growth. If temperatures are too cold, leaves may yellow and flowers may drop off. Peppers do best in well-drained soil. Space pepper seedlings 1½ to 2 feet apart in a row. Fertilize the area before transplanting pepper seedlings. Apply a side-dressing of fertilizer once the plants have been in the ground about a month. Keep moisture consistent by mulching around pepper plants. Uniform moisture is important all the way through to harvest time. Blossom end rot occurs if there is inconsistent moisture. Watch for common pests such as aphids (check the undersides of the leaves). Clean off with an insecticidal soap.